What can I do with my miniBox? Surfing : every website except common legal restriction is allowed (pedophilia, terrorism, etc…). You must agree with that by accepting the terms of service. Apps : you can use any app, except for those which request localization in your home country, such as some broadcasting or VoD apps. Phone calls and SMS : Our hotspot only connects you to the Internet. Your phone calls and SMS will still be charged as roaming. But to avoid the shocking bill, you can use skype, snapchat, viber and any other calling and messaging apps via Internet. Hmmm... not really ;) No mobile network operator in the world can provide you an unlimited and prepaid 4G data plan without any restriction (fair use and bandwidth cap). 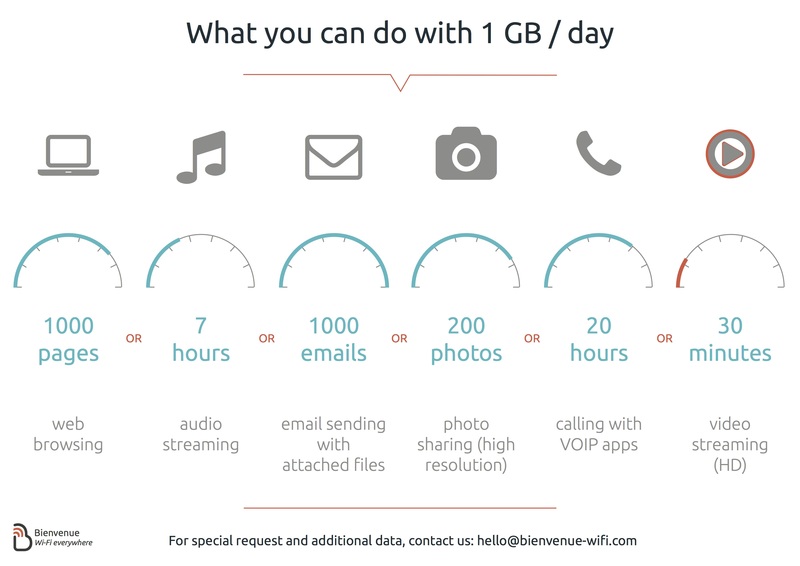 Our mission is to provide you a fast connection anytime, but to keep an affordable price, we put a comfortable 1GB/day allowance. You see, that's almost unlimited, except for HD TV. You can use the hotspot almost everywhere in France, thanks to the great coverage of our partner Bouygues Telecom. Find your coverage here. When should I book my miniBox? Sooner is better. If you order your miniBox at least 3 days before you arrive, standard delivery fees will be charged. We deliver the day before you arrive. If you order at last minute, we will deliver in express mode (3 hours in Paris) with additional fees. If you stay in a hotel, just write the hotel's address and the reception will give it to you on your arrival. Important if you are in an apartment : Please write the name written on your host's mailbox to be sure the French post will find the right one. How can I change my command? Make sure your device is connected to the miniBox Wi-Fi network to enjoy the Internet. We recommend to switch off data roaming in your device settings to avoid data roaming fees. Our service doesn't provide cellular calls or SMS facilities, but only data. If you use your smartphone to directly call or send SMS from France, you will be charged roaming fees by your domestic carrier. To keep in touch with your relatives with voice or text conversations, we recommend to use voice over ip (VOIP) and internet texting applications, such as Google Hangout, Facebook Messenger, Apple iMessage, Skype, Whatsapp, Viber, etc... which are compatible with miniBox. It takes 2 hours for a full charge of the miniBox. Be sure to have fully charged it before leaving a power source. The charge will last up to 24 hours in standby mode, up to 6 hours in use. Please use the casing provided in the package to prevent damage during the transportation of the miniBox. How to return my miniBox? If you rent your miniBox at a partner's desk, you will just leave it at the same place. If you ordered your miniBox on our website, you have to put the miniBox and all its accessories (cable, charger, user guide) in the provided prepaid envelope and post it in a yellow mailbox (destination : Paris) at the end of your rental period. When do I have to return my miniBox? You have to return the miniBox at the end of your reservation. As mentioned in the terms of service, if you keep it more than one week after the end of your reservation, we will debit your deposit. Different payment methods are accepted : Visa, Mastercard, American Express and Paypal. The transaction is secured by Paypal. Can I extend my rental period ? We will be very happy to extend your rental period if you enjoy our service ! If so, please directly send us an email ( reservation@bienvenue-wifi.com ) to tell how many days you want to extend your rental. We will send you an extension bill (no need to pay delivery fees again). Due to the value of our hotspot and its accessories, we make a pre-autorisation of 140€ from our customers, which will be charged only if you don't return it, or if it's broken when you return it. Please take a look at get started page. If a long press and hold does not wake up your hotspot, please try to charge the battery by plugging the device using the dedicated wall-plug. Please check if the hotspot is connected to a 3G or 4G network. If you can't see the symbol on the hotspot's screen, it's probably because you are in an uncovered zone. How can I contact the customer service ?